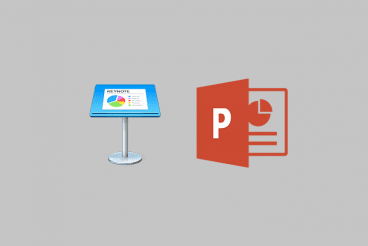 When it comes to making the choice of Keynote vs. PowerPoint for presentation software, understanding where each tool works best is key. Keynote is presentation software designed for Apple devices, so it will only work on computers, tablets, and phones running iOS software. Keynote allows users to create presentations that look sleek without a lot of design capability. The tools are easy and intuitive. The slide navigator includes options for designing slides with different layouts, animations, fonts and you can even bring in presentations from other software. So user-friendly that someone who hasn’t built slides before can use it. Plenty of high-design theme options to choose from. Basic setup helps you align and position elements for a sleek overall design. Great integration across devices – go from your desktop to phone to tablet and keep working on the same presentation. Animation, transition and transparency effects are polished and don’t have that silly look and feel often associated with presentations. Software is free on all iOS devices. Photo manipulation tools – i.e. cropping – is actually easy in Keynote. There are plenty of extra templates that you can download and add if you don’t like one of the included designs. The design looks less like a standard slide deck, with a more polished overall aesthetic. While Keynote is a powerful tool, the biggest problem is that it is only for Mac and iOS devices. Not as highly adopted as other programs. Does not support some 3D effects and shadows from PowerPoint; so beware if you bring slides over. There is a learning curve if you are coming from other software. If you are a Mac user and want to create presentations that don’t “look like PowerPoints,” then Keynote is for you. It’s relatively easy to use, comes installed with your OS (so there’s no software to buy) and provides a viable option for creating great presentations. PowerPoint is probably the most well-known presentation software. When it comes to comparing PowerPoint vs. Keynote, one of the biggest considerations is ease of use. If you’ve been using PowerPoint for a long time and are already comfortable with it, chances are that a switch might not be for you. While this software was originally designed for PC as part of the Microsoft Office Suite (now called 365), it works on PC or Apple devices. Whereas Keynote works well on mobile devices, many functions of PowerPoint are more limited when creating presentations away from your desktop. Most people have used PowerPoint of another Microsoft product and understand basic usage. There are thousands of themes and templates to choose from, as default options and as add-ons. Editing is easy and the interface and slides work using drag and drop. Other Microsoft elements from Word and Excel integrate seamlessly so you can add documents or spreadsheets to slides. Notes function converts slides to handouts that look and work great. Data and chart integration for building quick graphics works exceptionally well. Advanced functions provide a lot of control for experience PowerPoint users that can control almost any aspect of the design. Smart design suggestions can help you create more visually appealing slides if you aren’t working from a rigid template. Adding multimedia is flaky and doesn’t always work if you present on a device other than where you built the slideshow. Cropping and photo editing can be quite tedious. PowerPoint makes it too easy to create a bad design with garish animations and effects that deploy with just a click. You have to buy the software. There are a lot of features that most users don’t use; they can get in the way. PowerPoint is generally the best option in a team environment where people collaborating on slide decks are used to PowerPoint. It’s also the go-to option in a non-Mac environment. It’s highly compatible since slides will work on any type of computer and most people have some familiarity with using the software. PowerPoint is also preferred for users that are bringing complex data or charts into slides, because it integrates with Excel, making this functionality a lot easier. If you are working on a team that does presentations frequently and are in a Mac and PC environment, it’s probably a good idea to at least get comfortable with both pieces of presentation software. When it comes down to Keynote vs. PowerPoint, you don’t always get an option as to what type of software will be used. When you do get an option, many Mac users working in slides without massive amounts of data seem to prefer Keynote. For PC users or anyone working with charts and numbers, PowerPoint is the go-to option for creating presentations.